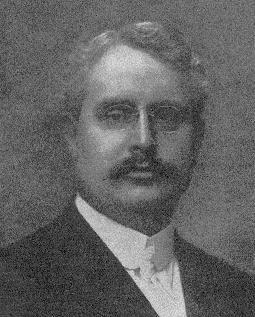 Commander-in-Chief Ralph Sheldon, M.D., was the oldest son of Dr. Andrew Flint Sheldon and Lucetta SalsBury, and was born in Pultneyville, New York, August 12, 1870. He graduated from Lyons Highs School in in 1888 and Albany Medical College in 1892. When he joined the Sons of Veterans is not known. However, he was elected New York Division Commander in 1899 and was a charter member of Jacob H. TenEyck Camp #154 in Albany. He had the honor of being a charter member of the Camp and signing the charter as Division Commander in 1899. The Camp still exists today but is known as Col. George Willard Camp #154. At the 26th National Encampment in 1907, held in Dayton, Ohio, he was elected Commander-in-Chief. He established his headquarters as Commander-in-Chief at 291 State St., Albany, New York, a 10 minute walk from the state capitol. He married Margaret Klinck of Lyons, New York on November 6, 1895. She died in 1947. There were no children that we know of. He did have an adult brother, Albert F. Sheldon, who was manager of the International Silver Company, Factory D, in Lyons. Brother Sheldon lived until 1950 and is buried in a small cemetery on Route 14, just north of the village of Lyons. Commander-in-Chief Sheldon’s father, Dr. Andrew Flint Sheldon, was the son of Ralph Sheldon and Minerva Flint and was born in Huron, Wayne County, New York on October 27, 1830. He received his early education at district schools and Red Creek Academy. He graduated from the Medical Department of the University of New York in 1852. They had six children. Three died in infancy. He was commissioned an assistant surgeon of the 7th New York Cavalry for about six months and a month with the 78th NYSV. He was on the staff of General Wadsworth where he served as executive officer in the Medical Director’s office, a position he held for 20 months. He was given charge of Campbell U.S. General Hospital at Washington, D.C., a position he held for about two years. Dr. Sheldon has the credit of in the War Department of originating and putting into practical use the continuous tent hospital which became in general use during the war. He was commissioned by Abraham Lincoln, as assistant surgeon, USV, on October 4, 1862 and surgeon, USV, April 13, 1863. Andrew Johnson commissioned he brevet Lt. Col. on August 15, 1865 for faithful and meritorious service. He was elected treasurer of Wayne County, New York,and was a member of A.D. Adams Post GAR, President of the Soldiers’ and Sailor’ Association Wayne County, Medical Director of the New York Department, GAR, the Grange and numerous other organizations.